The Hive Global Leaders Program is designed to educate and connect leaders who are making a big positive impact in the world. The curriculum has been built for mission-driven leaders, innovators, and entrepreneurs who are dedicated to creating a future that is radically better than the present. After Hive, you will have new ideas and frameworks to take back to your daily life that will make you a more effective leader, and you’ll be part of a global lifelong community of leaders working together on solving humanity’s greatest challenges. 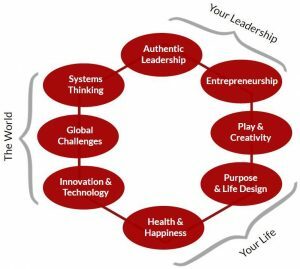 Hive provides transformative leadership training, integrating elements of entrepreneurship, purpose, life design, wellness, the arts, authentic relating, rapid prototyping and global systems thinking. On day one we look at what is happening in the world. We look at the Global Grand Challenges, look at how humanity is doing across health, education, economics, happiness, and the environment. On day two we discuss what is happening in your life, look at your health and wellness and your financial plan, go through a Designing Your Life Workshop, create your goals, reevaluate your habits, and create your personal one page plan. Finally on day three we look at what is happening in your work and learn about authentic leadership and scaling an entrepreneurial organization, cover expansion stage sales and marketing. Whether you are extremely successful and established in your position, or ready to transition toward a new place in your career, you will leave Hive with greater clarity on how your work can positively affect your community and the world. The Hive curriculum was designed based upon the team’s experiences with the Harvard Graduate School Leadership Institute, the Harvard Business School MBA program, the Singularity University Executive Program, the Stanford Designing Your Life course, the Art of Living Happiness Program, the Landmark Curriculum for Living, and the work of GoogleX innovator Tom Chi. Key Topics: What is going on in the world today? What are the macro trends of the 21st century? What are the biggest opportunities? Are humans making progress? What would the world look like if it were created based on the principle of equality of opportunity? How can we create a world that is sustainable and healthy for all people in our lifetimes? Key Topics: Are you truly pursuing your life purpose? Have you followed your passion and are you doing your best work? Are you able to be a fully expressed authentic leader who inspires your team? Are you consciously living or letting life pass by? How can you be fully present in the moment, be at your optimal peak performance, and enjoy every day while achieving more impact than you ever thought possible? How can you surround yourself with an extraordinary community of people to learn from and enjoy life with? Key Topics: How can you realign so that what you do actually aligns with your purpose? How can you align the impact you want to make in your life with where you get your income? How can you work full-time on your passion? How can you be part of solving the most important challenges of our generation? What is your theory of change? How will you fund the next part of your plan? How can you scale your customer, user, or donor base? What specific skills do you need to get to the next level as a mission-driven leader and entrepreneur? And what is your action plan for the next 6 months?